Waterfall House (Located in the Greater Philadelphia, PA Area) $1,000 gift is given to a player for helping to save the world -- rewarding conservation by using real estate more effectively. Ya know... I've always had these thoughts about living environments... like "tunnel under." Tunnel Under living has to do with living underground. It would be a last resort to escape from environmental threats. Over the last several years I've considered many designs and expressions of these ideas. The reality of an increasing temperature in my working area has forced me to take action -- forcing me to turn my dreams into reality. First, I started planing to move into the basement. The more I thought about it, the more I dreaded it. Right now my office is on the top floor. I look out over the tree tops. It is sort-of like being in a tree house. The view is beautiful. The feeling is uplifting. How could I move into the basement? Waaa! I had to think of a way to prolong my stay in the loft. The more I thought about it, the more I liked the idea of living in a waterfall. Recycle rain water and wasted "gray" water to irrigate my roof. ... and, it sure feels good! I've been giving lots of thought to water usage... how you were saying it would take toooo much water. That has been a fear of mine... so, I've worked on a plan to recover household waste water. This is purdy easy to do. When I'm getting the water temp. ready... or, when I'm just standing there... the water that misses me... goes into the bucket. 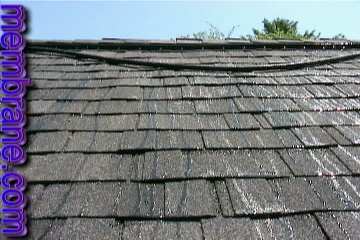 the water can flow to higher parts of the roof. Raising the right bucket to the top of the pyramid made the water flow to my hard to reach areas. Either several pumps, or one pump moved from location to location, can "step" the water up 10-20 feet at a time. I used one pump (cost 88 dollars).